Neehee's has brought a type of Indian food rarely found in Michigan all the way from the streets of Mumbai to... a strip mall in Canton. Advertising "Indian Vegetarian Street Food," Neehee's is the first restaurant in the area specializing in chaat — snacks sold by street vendors. With deep-fried breads and turnovers, crunchy sev noodles and nuts, all topped with an array of chutneys, purees, yogurt, and spices, Indian snack food is like nothing else. It's been a (rarely satisfied) addiction of Joe's since he first got to try it in Toronto. They're hard to describe, as they hit on a lot of sensations at once: cold, hot, spicy, sweet, salty, and crunchy. And you have to eat them fast, lest you add "soggy" to that list. Khasta Khachori (#21, $4.99): "Big spicy khachori filled with chutneys, yogurt, onions, and potatoes"
The chewy fried-bread khachori are a little hard to cut into with plastic cutlery, but they are completely worth the effort. We have no analogies for this; you just have to try it. During the time we were there, there was a constant flow of (mostly Indian) customers — a great sign for authenticity and for the health of the business. Masala Puri (#17, $4.99): "Crisp puris crushed and topped with green peas ragda, chutneys, onions"
Green peas ragda is a puree of green peas, warm and very nice. It's a great contrast to the crunchy puri pieces and crispy sev. Dabeli Dosa (#91, $8.99): "Dabeli stuffing mixed with ground nuts and onions, cut into pieces"
Dabeli stuffing is a spicy potato mixture which also includes chutney. On this one, you have the option of getting it with or without the additional pungent garlic chutney. By default they'll probably leave it off for non-Indians, so make sure you ask if you want it. The crunchiness of the noodles and the occasional chunk of nut really make this one. This dish is one of the fusion creations Neehee hopes to become famous for — taking a stock South Indian dosa and combining it with the filling of a Mumbai sandwich. Along with the classics, they've also got items like Mexican dosas, Szechuan Paneer dosas, and Jalapeno Pineapple uttapam. Works for us. End your meal with a selection of ice creams made in house. These aren't kulfi, as they have some air whipped into them. Flavors include fig, dried fruit with vanilla, and classics like mango and pistachio saffron. We were impressed especially with the saffron and fig. Joe asked what we were going to do for dinner. I said that I was going to cook Ethiopian, but I had realized that I didn't have enough onions. (Ethiopian dishes use a lot of onions — at least the ones I cook.) It was a beautiful Spring night, so we went out and bought some onions, and because it was a beautiful Spring night we kept driving through town until we found ourselves going up Washington. I pointed at Mahek and asked "Feel like Indian?" Mahek occupies the old Shehan Shah spot, and we had both been meaning to get here since the conversion and had high hopes for good food. And we were not disappointed. We only tried three dishes so this is hardly a full review, but we were happy with what we had and want to share. Mahek's menu warns that their "hot" really is "hot", and they aren't bluffing. We ordered the Gobi Manchurian as "medium", and it was as spicy if not spicier than the average "hot" is at most restaurants in Ann Arbor. We haven't tried the actual "hot" yet. For our mains, we ordered Chole Batura and a Chicken Tikka and naan. I first fell in love with Chole Batura at the now-gone Mysore Woodlands, so when I saw it on the menu at Mahek I knew immediately what I wanted. Chole is a spicy Punjabi chickpea dish (aka Chana Masala), and batura is a soft deep-fried bread. Mahek serves theirs with a raita, which is delicious on the chole, and a mixed achar (salty-sour pickled condiment). By the way, the chiles in Mahek's achar are not as hot as they look, so if you can eat medium-hot spicy food then you can eat the chiles in the achar. I was very happy with this dish, which is a good thing because as you can see, it's a sizable portion, which supplied me with lunch for the next day. Chicken Tikka (Tandoori-style chicken breast) is not something we normally order, though I think we'd order it more often if it was always as tasty as the dish we had at Mahek. The chicken was surprisingly tender and moist, and — bonus for those of you who don't like chicken on the bone! — it was boneless. The verdict: definitely worth going to again and experimenting with the menu. Mahek also has a lunch buffet. If any readers out there have tried their buffet, we would love to hear about your experiences. I was on my own tonight — meaning, I was cooking for one. Joe is off to Columbus, Ohio, getting to enjoy North African food from Firdous Express and Jeni's Ice Creams at the North Market. While I am at home. Cooking for one is not as much fun as cooking for two or three or more, but I was determined to not spend the evening eating handfuls of cereal out of the box. I pulled out The New Tastes of India, which I've been meaning to explore more, and settled on a simple mung bean curry and this cheera thayir curry as a vegetable side. Heat oil in a large sauce pan. When hot, add mustard seeds. When the seeds begin to pop, add the garlic, dried chilies, curry leaves, and fenugreek. Cook, stirring frequently, over medium heat for two minutes. Add the onions, green chilies, and ginger. When onion browns, add the tomatoes and tumeric and some salt. Mix thoroughly, then add the spinach. Cook for 5 minutes, stirring occasionally. Remove pan from heat. Gradually add the yogurt, stirring slowly and continously. Return pan to the heat and cook for 5 more minutes, stirring constantly. Serve lukewarm. I quartered the recipe, and it made just the perfect amount as a small side vegetable dish for one. I didn't have fresh tomatoes on hand, so I use canned ones, which worked well enough. In Ann Arbor you can find curry leaves at any of the handul of local Indian grocery stores. I find mine at Bombay Grocers at 3022 Packard St. They're in the refrigerator cases at the back of the store. I had some kale as a part of my CSA farm share from Tantre Farms. In fact, I have more greens stuffed in my refrigerator than I know what to do with, and I need to use them by Saturday, when I pick up my next share of the harvest. But back to the kale — I knew I needed to use it soon or lose it. Since I'm splitting the share with a friend, I didn't have a lot of kale, so I was worried that any recipe would require more than I had. I turned to Madhur Jaffrey's Madhur Jaffrey's World of the East Vegetarian Cooking, which has never let me down, and found one kale recipe: Cado Verde. I had just enough kale to make a half-portion, which easily serves three people as a soup course and can be stretched to serve four. 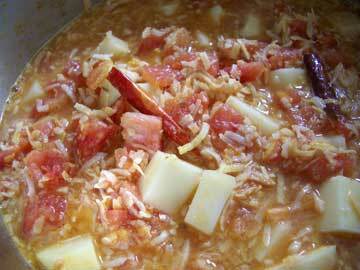 This is a Portuguese recipe by way of Goa. Kale, potatoes, onion, and garlic simmered and pureed into a lovely creamy green soup and garnished with a swirl of olive oil and black pepper. Even Joe liked it, and he's not much of a fan of soup. It's an easy recipe that can be simmering on the stove while the main course is prepared. In a large pot, combine the potatoes, kale, garlic, onion, and salt. Add 6 cups of water and bring to a boil. Cover and lower heat to a simmer. Let cook for about 1 hour 15 minutes or until the kale is quite tender. Puree the soup. 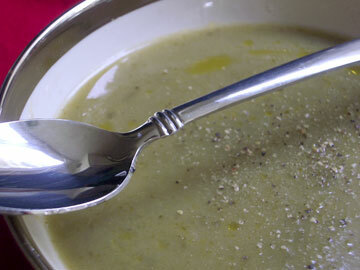 In as many batches as necessary, pour the soup into a blender or food processor and blend until smooth. (I used a hand-held blender.) Pour soup back in the pot (if necessary) and taste for salt. Add more water if the soup seems too thick. Just before serving, add the olive oil and black pepper. As an extra "garnish", I added a very light sprinkling of Portuguese sea salt. We really enjoyed the small bursts of flavor as the grains of sea salt melted on our tongues. I was making my favorite lamb keema when I used up the last of our garam masala. This is considered a tragedy in our household that must be remedied at once. This Pakistani-style garam masala comes from 100 Best Balti Curries , and is very different from the cumin- and corriander-based garam masalas commonly sold in the States. I love the flavor and scent, especially the star anise and nutmeg and cloves. It's easy to make, and there's nothing quite like fresh garam masala that hasn't spent months sitting on a store shelf before making its way to your kitchen. Bunium persicum is harder to find in the States, and you'll more often see Nigella sold as "black cumin". You can get both kala jeera (black cumin) and charnushka (nigella) from Penzeys Spices. Brown caradamon has a smoky flavor that's quite different than green caradamon. If you don't have black caradamon, substitute green pods. You'll still get a tasty garam masala. In fact, if you don't have black cumin, try the recipe with regular cumin. It'll still be good. 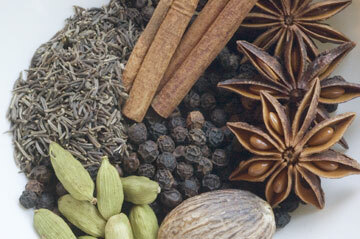 Garam Masala is a highly individual thing -- every chef has their own recipe. Use the spices you like, and you really can't go wrong. 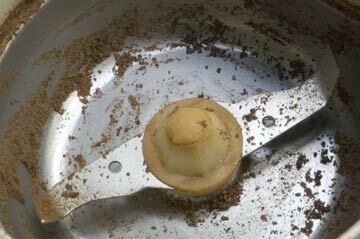 The basic preparation method is the same: lightly dry-roast the spices then grind to a powder. Gently roast all spices and grind everything to a fine powder in a coffee or spice grinder. Store in a tightly lidded small jar. I usually make a double-batch, which will last me a bit. My coffee grinder is small enough that I have to process the spices in batches. It has no trouble with the whole nutmeg. The cinnamon sticks have been the hardest to grind well. I like to break them into smaller pieces before putting them in the grinder. If your coffee grinder does double-duty as both a coffee and a spice grinder, you will need to clean it really well afterward (see below) — unless you want garam masala flavored coffee. A few Sunday's ago, Joe and I went to Khana Khazana for Sunday brunch. Oh wow. Just... Wow! I cannot begin to describe all the wonderful foods they serve on their Sunday brunch. This is, to be truthful, in part because I did not write them down, but I wanted to -- no, I must -- share with you this marvelous offering. Khana Khazana offers a brunch every weekday, but on Sunday's, they expand their brunch menu. 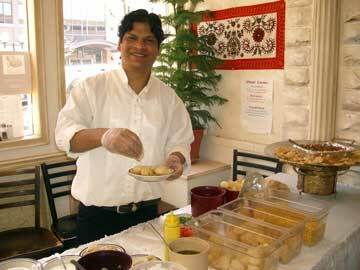 At the front of the restaurant you'll find Indian street snacks prepared fresh upon your request. The day we went, the Sunday buffet offered two Indian snack foods: Bhel Poori (first photo at right) and Pani Poori (second photo at right). These foods are staple offerings of road-side food stands in India, and they can be difficult to find here in Michigan. Chaats are addictive, and you may find yourself craving more and different ones. Fortunately, Khana Khazana can help. A list taped to the wall describes the other chats available, and be sure to check out their regular menu for additional items, and they are not to be missed. And if the snacks and immense buffet were not enough, by request, Khana Khazana will also prepare a fresh "mini-dosa." A dosa is a thin crepe made from a lentil or rice batter. Here, Khana Khazana's chef was kind enough to create full-sized one for me to photograph. 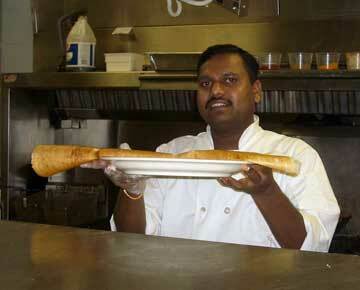 Below are snapshots of the chef preparing a dosa. Double-click on the images for larger versions. Wow. Now I'm hungry. Just thinking about their food has me thinking about talking Joe into going back there this Sunday. Dinner M-W 5:30-10pm, Th-Sat 5:30-2 am, Sun 5:30-9:30 pm. IMBB 14: Orange you gonna have some Carrot Halva? For IMBB #14, Ladygoat asked us to cook it up orange. As the orange cake was a bit less than orange-colored, it was back to the stove top for something orange that I could make without an extra shopping trip. The only orange food I had readily available was a bag of carrots. Lucky me. I love Indian sweets, though I don't often cook them. (I have yet to master the art of making jalebi.) Carrot halwa takes a bit of time, but is otherwise a snap to make and only requires a few ingredients. Grate carrots. Cook them in the milk with the caradmon pods and optional saffron. Bring to a boil then turn the heat down to medium and cook, stirring frequently until all the liquid is gone. Heat the ghee in a frying pan over medium-low heat. Add carrot mixture and fry until the carrots look dry-ish. (10-15 minutes or so) Add the sugar and nuts and fry for two more minutes. Note: while you could use vegetable oil instead of ghee or butter, you'll miss out of the flavor that ghee adds. I've used chopped walnuts when I didn't have almonds, and I thought the walnuts went well with the carrots. If you like, you can also add a tablespoon or two of sultanas (golden raisins). It's been the year of "not quite a summer." The wet wet spring and cool temps mean local harvests have generally sucked for everyone. But while my basil and peppers have languished, my tomatoes have oddly thrived. I wasn't sure I'd get much of a crop, but lo and behold I am awash in tomatoes. They've been slow to ripen, but ripen they finally have. The photo was taken right before boiling. Two dried chilies isn't enough to make it hot, but rather adds a nice subtle flavor to the dish. Peel potatoes, cut into 3/4 inch dice dice, and soad in a bowl of cold water. Heat oil in a heave pot over medium-high flame. When hot, put in garlic. Stir for 5 seconds. Add red pepper(s) and whole cumin seeds. Give it a stir. The garlic should brown slightly and the red pepper should darken and cumin should sizzle. Lower heat to medium and add coconut. Stir for 10-15 seconds (to get it all coated). Drain potatoes. Add potatoes, ground cumin, tomatoes and their juice, salt, and 1 1/2 cups of water. Bring to a boil. cover, turn heat to low, and simmer for about 45 minutes ot until potatoes are tender. Stir gently ever 7-8 minutes. Add sugar and vinegar. Stir and cook uncovered for 1 minute. 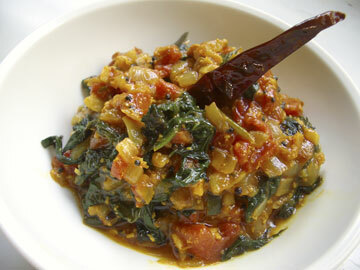 This dish goes well with "Oily Toovar Dal with Cloves" (p. 111 of the same cookbook) and paratha or naan. The last Monday in May is Memorial Day in the US. It's the time for beaches, camping, and BBQs. Our friends Kristen and Jack hosted a potluck BBQ. I whipped up a batch of chocolate chip and apricot cookies, and Joe said, "Everyone brings desserts. Can we bring something with protein in it? How about chickpeas?" It's 12:30. The BBQ starts at 1pm. I wracked my brain and my cookbooks for something easy that doesn't require too many fresh ingredients (because we need to go shopping). The original recipe uses cilantro, but I think mint is even better. 3 to 4 Tbs coarsely fresh cilantro or mint. Drain the chickpeas, rinse with water and set aside to drain. If necessary, toast and grind cumin seeds (the second listing of cumin only). Heat oil over medium high heat. Add asafetida. Let sizzle for a second. Add cumin seeds let sizzle for 15 seconds. Add onion. Stir and fry until onion edges turn brown. Add garlic. Stir and fry until it turns golden. Add tomatoes. Stir and cook until they turn dark and thick. Add ginger and stir. Add chickpeas and remaining ingredients. Bring to simmer. Lower heat and simmer uncovered for 10 minutes, stirring now and then.